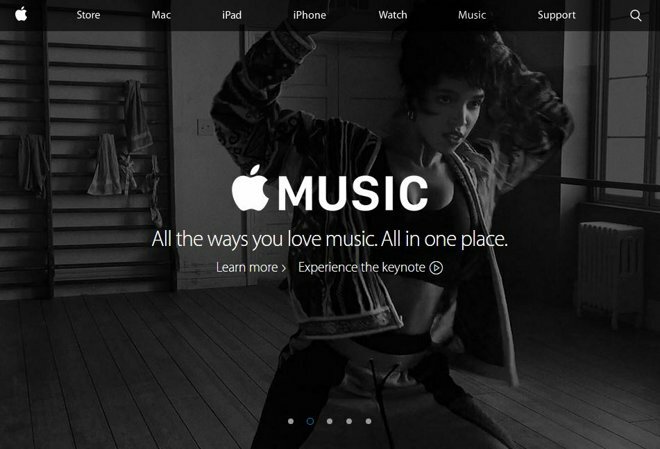 The iPod's place in Apple's website main menu has been taken up by Apple Music, which was announced during Monday's WWDC keynote. In the company's current product lineup, the menu space is otherwise reserved for hardware, including the Mac, iPad, iPhone, and Apple Watch. The disappearance from the top menu does not mean the end of the iPod yet: iPods are still being sold, but can only be found by going to the online Apple Store, or scrolling to the bottom of the Apple Music page. The iPod lineup has become increasingly marginal to Apple financially, with sales declining every quarter for the past several years, and the company even declining to reveal quarterly sales going forward. This was precipitated at first by the iPhone, and then by the general popularity of smartphones, which have all but eliminated the need to carry a separate portable device for music. No major iPod updates have been made since 2012. The iPod classic was in fact discontinued in September 2014, and recently the only sign of life has been a rumor that a product refresh could happen later this year. If it does happen, changes are expected to revolve around the iPod touch, which might gain things like a faster processor and more memory. Less certain is the fate of the Nano, which sports an operating system that mimics iOS without using the same software architecture. Apple could be grooming the Apple Watch as a kind of replacement. Although it costs at least $349 —$50 more than the most expensive 64-gigabyte iPod touch —it includes 8 gigabytes of onboard storage, capable of music playback when an iPhone is left at home. Future versions of the Watch could increase that storage and come down in price, and offer greater connectivity, such as tapping into the Apple Music streaming service.